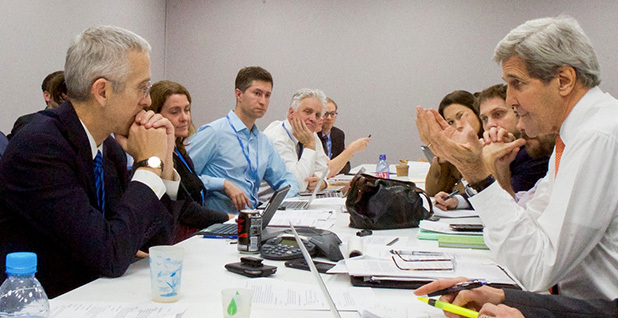 Former U.S. Special Envoy for Climate Change Todd Stern (left) sits across from Secretary of State John Kerry in the U.S. center in Le Bourget, France, last year discussing the negotiations toward a new global deal. Stern was one of the lead architects of what would become the Paris Agreement, a deal more than five years in the making that President-elect Donald Trump has vowed to cancel. Photo courtesy of the U.S. State Department. Former U.S. Special Envoy for Climate Change Todd Stern in an exclusive interview with E&E News said he was deeply disappointed by Tuesday night's results. Trump has said he will abandon the deal that Stern spent 7 ½ years helping to broker. "The last thing I am right now is Pollyannaish," he said. "And the last, last thing I am on Earth would be any kind of an apologist for Donald Trump." But Stern, who stepped down in the spring after helping guide the Paris Agreement across the finish line in December, said he also isn't "jumping to a conclusion" about what Trump might mean for Paris. Trump's climate statements from the stump, Stern said, have been "completely unhelpful." But, he said, candidates' statements don't always track with their actions once they take office. "I've seen administrations come and go, and the fact that there were some applause lines tossed out there on climate doesn't necessarily mean that he, for example, pulls out or walks away from Paris," he said, declining to offer examples from the past, "although he might." In Trump's case, he consistently pledged to withdraw from the deal reached by nearly 200 countries after more than two decades of talks — or at least to "renegotiate" it. Trump also promised to strip the U.N. Framework Convention on Climate Change of all U.S. funding — something his U.S. EPA transition team head, Myron Ebell, said must happen anyway under domestic law because of the status the body has granted to Palestine (ClimateWire, March 23). Trump also said "billions and billions" of dollars now being spent on federal climate programs would be redirected to infrastructure and other purposes. But Stern said he will reserve judgement until Trump has time to choose his core international advisers, including his secretary of State, national security adviser and chief of staff of the White House. He hopes seasoned policy experts will see the diplomatic price of abandoning Paris as too high. "I think it would be hugely damaging for our longer-range credibility," said Stern, echoing a sentiment expressed by many climate advocates in the hours since yesterday morning's surprise result. "I think it would radiate beyond the climate context." 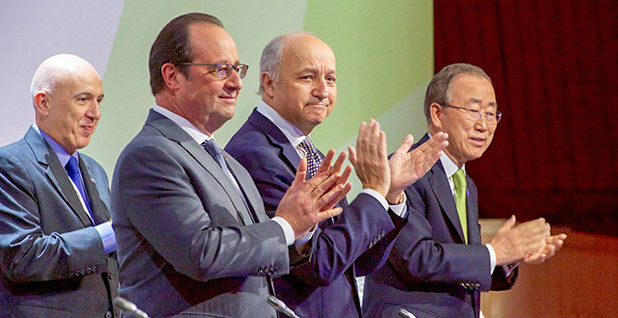 French President François Hollande, French former Foreign Minister Laurent Fabius and U.N. Secretary-General Ban Ki-moon applaud as 200 nations agree to the Paris Agreement on Climate Change last year. Photo courtesy of the U.S. State Department. The Paris Agreement ultimately came about because President Obama expended great political capital throughout his second term to elevate climate change in personal talks with other heads of state. The main U.N. negotiating process or related issues like curbs on heat-trapping coolants and refrigerants were often on a very short list of issues Obama would raise at both one-on-one and larger multilateral meetings with presidents and prime ministers. Backing away from a globally popular deal after such an aggressive and prolonged push "would anger countries all over the world, important countries," said Stern. "It would anger people in the multilateral context and in important bilateral contexts where the Trump administration will have all kinds of other important priorities and business that they'll be wanting to get done," he said. "So why would you — just for no real reason other than to make a political point — why would you shoot yourself in the foot like that?" Stern is not attending the U.N. summit underway in Marrakech, Morocco, the follow-up to last year's Paris conference where the accord's rulebook will begin to take shape. But he said the negotiators there were well aware of the potential consequences of the U.S. election. "People were watching very closely and holding their breath and hoping it was going to work out in a way that it did not work out," he said. Stern said he hadn't spoken with his former colleagues since the final tally, but said, "I'm sure that there is a lot of consternation and uncertainty among other countries." U.S. Special Envoy Jonathan Pershing, Stern's successor and onetime deputy, will now have the task of leading an Obama administration negotiating team through Marrakech while the Trump administration waits in the wings. Stern said he assumed they were fielding many questions from other delegations, but he said their job hasn't changed much. "The new management isn't there yet," he said. "President Obama's still the president." The Marrakech conference is not a particularly difficult one for Pershing and his team to navigate under the current circumstances, said Stern. The major political bartering of last year has given way to long-term discussion about the nuts and bolts of implementation. "My guess is they will continue to kind of stay the course," he said. "Instinctively, that's I think the way I would approach it."